After receiving the text indicating a real-time spike in ammonium and conductivity, field technicians dropped what they were doing to track the potential illicit discharge. 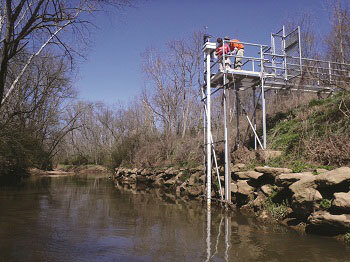 Something unusual was going on near one of the stormwater monitoring stations in the Reedy Watershed. The team quickly mobilized and drove to the station. Using a portable water quality sonde from YSI, the team began taking readings around the station, and then continued to take readings as they hiked upstream in search of changes in the water chemistry. First they found a small pipe dumping water in the river; they traced the pipe back to a small tributary. Finally, they pinpointed the source to a small drainage ditch where a sanitary sewer manhole was blocked and overflowing. Just as they arrived on the scene, a citizen was calling in to report the sewer problem. The real-time alerts from the continuous monitoring station had given the team fast insight into a suspicious discharge and they reacted quickly to address it. Managing stormwater pollutants from the County Municipal Separate Storm Sewer System (MS4) is a requirement for the Greenville County, South Carolina, Land Development Division. Recognizing the need for more data to meet permit requirements, the county - a Phase 1 MS4 permit holder - transitioned from a grab sampling program to a continuous monitoring program five years ago. “Continuous monitoring provides us with the type of information we need to meet our permit requirements. Our consultants used the analogy that a grab sample was like taking a picture with a camera. It only gave you one image in time, whereas continuous monitoring was more like a video that gives us a better idea of the action taking place over a given period of time. It seemed to make sense for an MS4 because we were more concerned with illicit discharges and conditions during rain events,” said Judy Wortkoetter, County Engineer. Although a continuous monitoring program required upfront capital expenditures, the entire annual cost associated with ongoing management/analysis for one continuous station (with data collection every 15 minutes) is roughly equivalent to the cost associated with the collection of just one daily grab sample for a full year. The dynamic conditions associated with rivers and streams demand much more data. The switch to continuous monitoring has also yielded a robust, multi-purpose dataset that can be utilized by other departments for a range of needs such as the detection of spills or other types of illicit discharges, further extending the value of the investment. For example, a sewer overflow is often reported. Illegal dumping and other discharges usually are not, potentially jeopardizing the county’s compliance with their National Pollutant Discharge Elimination System (NPDES). Therefore, the county has been tracking the baseline health of their major waterways and knows when something veers away from the norm. The quicker they can trace the source, the quicker they can put a stop to it. Greenville County didn’t take the leap to continuous or event monitoring all at once. First, the county partnered with Woolpert on a pilot study of six continuous water quality monitoring stations with YSI multiparameter water quality sondes. Woolpert provides NPDES program management services for the county and is a multi-disciplinary consulting firm that provides infrastructure management, geospatial, and design services. “We were impressed with what we could see with the continuous data,” said James Riddle, Project Manager at Woolpert who managed the pilot study. Riddle said it was “eye-opening to see the daily fluctuations in data, such as dissolved oxygen” and then, more importantly, the spikes when the data showed something other than the norm. “The data from the sondes was pointing to illicit discharges, and we wouldn’t have known it was going on” if not for the continuous, high-frequency data. After the convincing results of the pilot study, Greenville County worked with Woolpert and YSI Integrated Systems & Services to install permanent stations at six different locations complete with data loggers and telemetry for remote accessibility. Over the last four years, the team has installed an additional six monitoring stations for various short- and long-term study needs. The main objectives of this data collection system are to detect and track illicit discharges and to approximate annual loads for Total Maximum Daily Load (TMDL) requirements. In addition, the stage/rainfall data is proving valuable for use in calibrating floodplain models and is being used by the National Weather Service for weather and flood warnings. The team carefully selected sites throughout the watershed for permanent and temporary stations. “If you pick the wrong site, you pay for it later,” noted Riddle. He commends the good collaboration among city and state governments, in particular the City of Greenville and SCDOT, for allowing the team to access and use public land managed by the various groups. In this way, the stations are situated to collect high-quality data in the areas of concern at specific sites that maintain perennial flow. For these stations, the YSI team proposed a monitoring solution that would still allow for in situ water monitoring, but with all operation and maintenance of equipment from the bank. These installations included a stilling well installed parallel to the slope of the bank, a water quality sonde housed inside the well submerged into the water, and a fiberglass instrument enclosure for the data logger and remote telemetry. Permanent stations, used for broad monitoring objectives in streams and rivers, are more robust than the temporary stations and enable more mounting options for placing the water quality sonde and other water quality sensors/pumps. Based on previous permanent monitoring station installations, YSI proposed aluminum structures in a configuration that would reduce the portions of the structure in the water. The goal was to keep large debris from collecting at the base of the structure during a storm water event and potentially interrupting data collection or damaging the equipment/structure. The flag-shaped design creates a large work area, allowing multiple technicians to be on the platform together. “A key feature of these installations is the safety that these stations offer the technicians that service the sites. The stable aluminum platforms allow technicians to get out over the body of water without having to physically get into the water. They can go pull their YSI water quality data sondes for servicing while never having to get wet or deal with potentially dangerous rapidly moving water,” said Rob Case, YSI Project Manager. With a network of stable monitoring stations, Greenville County has a wealth of data continuously flowing in. 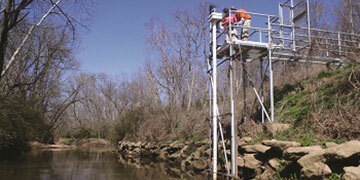 The system allows the county to continuously monitor water quality as required by its NPDES permit. The County hopes that the baseline data will also allow them to assess the impacts of various new programs designed to maintain or improve the health of the watershed, such as best management practices associated with construction, land use regulations, and future TMDLs. “With continuous monitoring we can see emerging patterns like whether an illicit discharge occurs regularly around the same time of day or week and for a certain length of time. This helps us quickly narrow into the source of the discharge and eliminate it. Quicker elimination of illicit discharges better meets our goal of reducing pollutant loads in our river and streams,” said Wortkoetter. “Continuous stormwater monitoring is about risk management,” said Riddle. Cities and counties can use real-time data for “quick responses to illicit discharges, for flood modeling, and for calculating the contributions to total pollutant loads.” Watching the watershed has become more effective.